Instrotech Australia manufactures weighing amplifiers, indicators, and transmitters in panel-mount, rail-mount and field-mount versions. 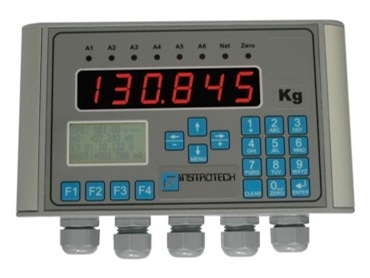 The range comprises Load Cell Indicators and Transmitters, Batching units, Loss-in-weight feeders, Bag-fillers, Throughput weighers, Dynamometers and Belt Weighers. Fully programmable in plain language with a main LED display and a 4-line LCD display these instruments have isolated power supplies and isolated analogue output as standard. Plug-in option boards include up to 6 relays, serial output, USB and Ethernet. Factory fitted options include SD cards for data logging and GPS modules for mobile and mapping applications. Instrotech also sells and supports a large range of Load Cells, a selection of which is listed elsewhere on this web site. There are many different types and styles of load cells for all applications, together with their associated mounting hardware.